We introduce a new printing technique! sPrint Textile Decorations now provides sublimation decoration services, along screen printing, screen transfer, embroidery, DTG and digital transfer. As its definition goes, the sublimation process is the transition from gas directly to solid phase, and vice versa, without becoming liquid. In our case though, the process is not entirely complete; the liquid inks transform in solid state through the printed paper, that converts in the gas state in the transfer process and ends up being a solid state on the decorated product. This is a modern and precise method of decorating apparel and accessories. Sublimation is similar to the digital transfer technique, it uses almost the same steps in the decoration process. A main difference though, the digital transfer is that digital transfer printing cover the exterior of the products, it does not insert itself in the fabric. 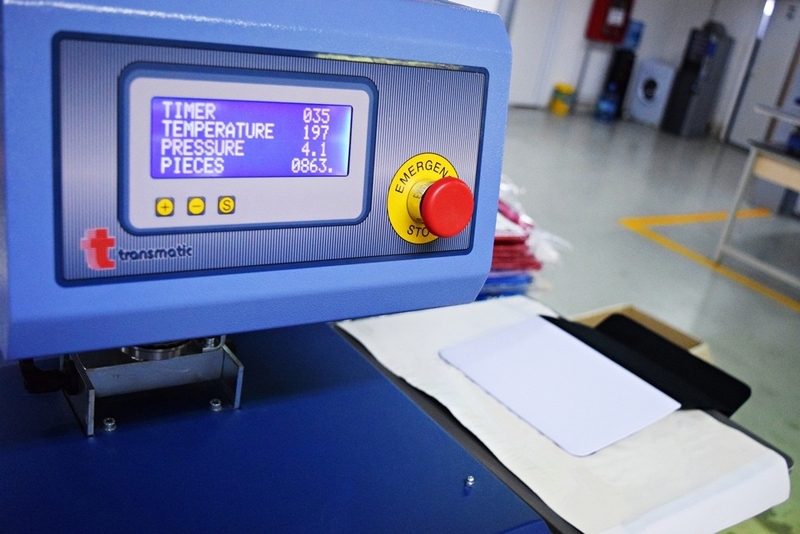 In the field of printing, the sublimation term is used to describe the heat activated inks that turn into gas at high temperatures through paper and have the ability to form a chemical bond with acrylic or polyester surfaces. The designs or pictures that are sublimated are water resistant, long-lasting and not easily scratched off. The image is projected within the material, not on it, like other printing methods. Its unique advantage is that it lasts the longest and it guarantees 100% image printing, decoration on the product. When using this method, the image merges within the product that is applied on, and eliminates any chances of malfunction. Due to it's precision, accessories with harden polyester or acrylic exteriors are usually the intended product target, like backpacks, wallets, casings, traveling items - luggage, makeup kits. It is developed with full process inks, CMYK, and it ensures the highest level in digital printing. It is used especially on apparel, but also on wood, hard plastic, metal, glass, and other materials. All items must be at least 50% made of or treated with acrylic or polyester. Due to its long-lasting and water resistance characteristics, flags, umbrellas and sporting apparel are usually the products which use sublimation. So sPrint Textile Decorations is proud to introduce the new printing technique, among the other methods of decoration: Sublimation Printing! This customization method allows your logos, designs and, especially, photo-lab-quality pictures to be accurately printed on your chosen products. It is an easy, safe and explicit technique, which gives you the opportunity to have decorations at a high-quality resolution. Using the dye-sublimation printing, the image’s colors do not need a color separation; the process is done in inkjet printers. Details can be distinguished from a far, making digital pictures or photos look realistic and clear-cut. What would you like sPrint Textile Decorations to sublimate for you? Hi, is possible tell me the price for 100 pcs this tshirt Sublimation all over ? Shipping for France.